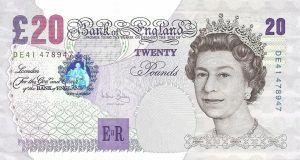 Home › Overcoming Objections › Price Objections › How Much Would You Pay for a £20 Note? How much would you sell me a brand new £20 note for? I’m not going crazy – hear me out – this might be one of the most important nuggets of sales sense you could share with your team all week. If you had a £20 note how much would you sell it to me for? £15? Maybe £18? How about £19.99? Which is fair enough – so why – when you give a sales team something to sell that’s priced at £20 – a large percentage would ask how much they’re allowed to move if the customer asks them for a deal? What’s the wiggle room on price? Everyone believes in the value of money – they never argue with the number written on a bank note. But very few people ever take the time or effort to build a “belief” in the value of their own product or service. As an example, if I offered you £190 for ten £20 notes (a mere 5% off for cash) you would instantly recognise it as a bad deal and politely turn me down – you’d quite rightly only swap your £200 for something that was worth the same value. But if you came into my office to sell me something for £200 – would you consider a small discount to get my custom? How about for a £2,000 sale – or a £200K piece of business? The thing is most people will ask you what the deal is – because if you don’t ask….. you don’t get. On my sales training travels I’ve discovered that phrase is quite international: if you don’t ask you don’t get – so everyone sitting on the buying side of the table has to ask. Take a look at your favourite customer – or a client who has been loyal to your business for years – or the last, massive order that went out the door. Ask those customers where they see the value, learn from them so that you can transfer the value that they’ve discovered onto others who need your help. Charge the right price – and then understand the problem your solving well enough to be able to justify the value. Don’t go out there desperately selling to people – Solve their problems and then charge them appropriately for it!